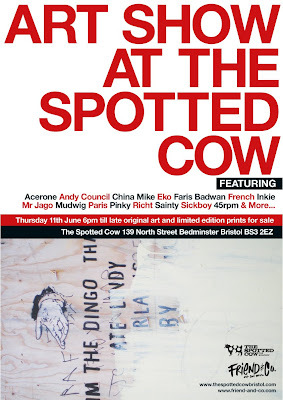 We have a show at THE SPOTTED COW pub in Bedminster on Thursday the 11th of June. It's in the garden so is slightly dependent on the British weather, but here's hoping for sunshine! It starts at 6pm and will run until it gets dark! There'll be original work and prints from all of the artists we've had the pleasure of working with since we opened in the autumn of 2008 and some we haven't (yet!)... 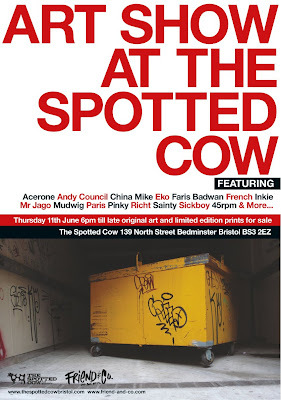 The show will include: Acerone, Andy Council, China Mike, Eko, Faris Badwan, French, Inkie, Mr Jago, Mudwig, Paris, Pinky, Richt, Sainty, Sickboy, 45rpm... and more!